Adult Males nose to tail up to 13 feet. around 9 feet.There Tails being 3 to 4 feet. Females slightly smaller at 300 pounds. Solitary, except in breeding season, when they come together to mate. Deer, antelope, oxen, wild pigs. The white tiger origin was recorded in India during the start of the HB Mughal period from 1556 to 1605 A.D.
During the last 100 years, only about 12 such white tigers have been seen in India, resulting in 1 in every 10,000. Ancestry traces back to a single white male known as Mohan, captured in 1959. The Maharajah who captured the Mohan soon figured out the only way to produce additional white tigers was to breed him to his own daughter. Becoming the first generation in this century. Prices for a white tiger today start at $60,000. White tigers carry a gene that is only present in around 1 in every 10000 tigers. White tigers are prone to having crossed eyes (a condition known as strabismus)The White Tiger is just that. 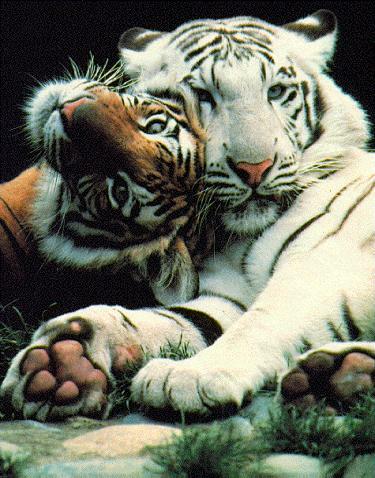 This is not a separate subspecies of the Bengal Tiger and they are not Albinos. They have ice blue eyes, a pink nose, creamy white fur and chocolate brown to black stripes. A white tiger can be born from a mating of two orange tigers carrying the recessive gene, known as a double recessive allele. A Bengal tiger with two normal allele or one normal and one white allele is colored orange. Only a double dose of the mutant allele results in a white tiger. How you get a White Tiger! There is no such thing as a snow tiger. All white tigers originate from the first white tiger "Mohan", from India. The white tiger was hunted to extinction from the 1700's by the Maharajah, who thought if he killed the Great Ghost Cat, it would bring him spiritual greatness. They were hunted to extinction and disappeared until "Mohan" was spotted in 1959. Their white color does not help them in their natural environment, the jungle. Rather, it is a hindrance, as the white stands out instead of blending in.